The early Shakers did not articulate a fixed creed or doctrine. In the spirit of English religious dissent that drew its adherents from the country’s petty tradesmen, artisans, and laborers, they were deeply affected by a sense of God’s immanence in a lost and sinful world. As a consequence, they were drawn to millenarian prophecy and speculation about the Second Coming of Christ. Attracting few converts in England, the Shakers might well have been lost to history were it not for the reception into their numbers in 1758 of Ann Lees (the name was shortened to “Lee” in Shaker usage), the daughter of a Manchester blacksmith. Ann Lee (1736–1784), whose own religious background was Anglican, not only became leader of the group but was so influential in the development of its belief system that she is recognized as the founder of the Shaker faith. Because of the noisy exuberance of their worship, the Shakers attracted the hostility of their neighbors and the civil authorities; several Shakers, including Ann Lee herself, were fined or imprisoned in the early 1770s. In 1774 Mother Ann—as her followers now called her—led a small group of Shakers to America, following a “special revelation” that the faith would flourish there. On August 6, 1774, Ann Lee and eight followers disembarked in New York, after a lengthy sea voyage from Liverpool. During the next ten years, Mother Ann and her companions undertook preaching journeys in upstate New York and New England. By the time of her death, in 1784, the groundwork had been laid for the organization of Shaker communities throughout the region and beyond. Under her American-born successors, Father Joseph Meacham (1741–1796) and Mother Lucy Wright (1760–1821), Shakerism was established in New York, Connecticut, Massachusetts, New Hampshire, Maine, Ohio, Kentucky, and Indiana. In their self-contained villages, the members of the United Society of Believers in Christ’s Second Appearing, as the Shakers became formally known, practiced celibacy, separation from the world, communal ownership of property, pacifism, and confession of sin, all of which they based on the New Testament accounts of the life and teachings of Jesus. Women enjoyed equality with men in the various departments of community life, a practical application of the Shaker concept of God as Father and Mother. An emphasis on simplicity, harmony, and perfection within the communities prompted the development of a distinctive tradition in the arts and crafts, notable for its paring down of vernacular forms. Shaker furniture is simple but elegant, without decorative turnings, carvings, or painting, but exacting in craftsmanship and purity of line. At its height in the first half of the nineteenth century, the United Society comprised nineteen principal communities, with approximately five thousand members. At first reviled by their suspicious neighbors, the Shakers in time were admired for their neat, efficient farms, the excellence of their products, and the innovative technology and genius for invention that marked their history. By the mid-nineteenth century, however, a slow but unremitting disintegration, the result in large part of a failure in leadership, began to affect the Shaker villages until, one by one, they closed. Only three villages survived into the second half of the twentieth century—Hancock, Massachusetts; Canterbury, New Hampshire; and Sabbathday Lake, Maine. Today only Sabbathday Lake remains as an active center of the Shaker faith. 1. Calvin Green and Seth Youngs Wells, A Summary View of the Millennial Church, or United Society of Believers (Albany, N.Y.: Packard & Van Benthuysen, 1823), 5. 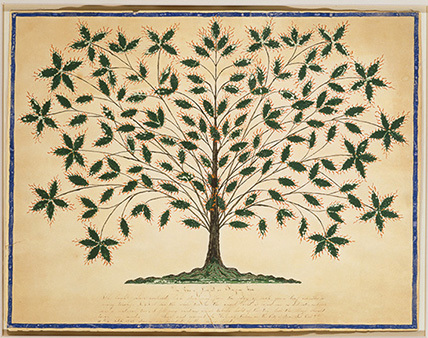 Source: Stacy C. Hollander, American Radiance: The Ralph Esmerian Gift to the American Folk Art Museum (New York: Harry N. Abrams in association with American Folk Art Museum, 2001), 523. Self–Taught Genius: Treasures from the American Folk Art Museum and its national tour are made possible by generous funding from the Henry Luce Foundation, as part of its 75th anniversary initiative.